Jose Raymond’s chest routine guaranteed to give your pecs a boost. Sit on an incline bench holding a pair of dumbbells resting on your thighs. Lie back and begin with the dumbbells just outside your shoulders with your arms bent, feet flat on the floor, and head resting on the bench. 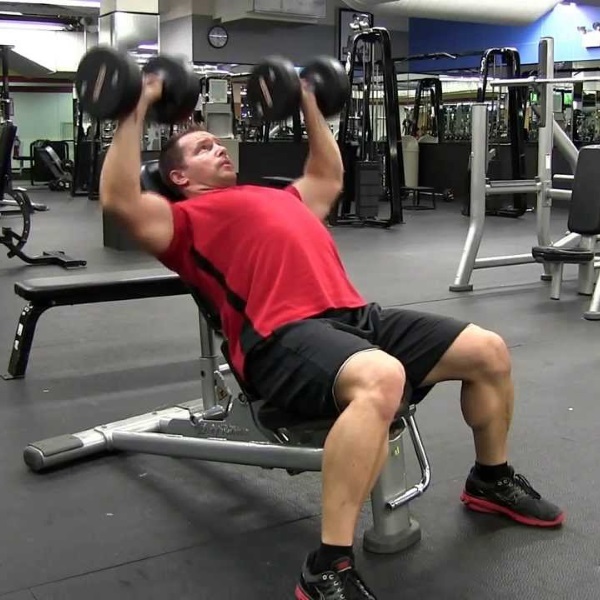 Forcefully press the dumbbells straight up to the ceiling by contracting your pecs and extending your arms. Stop just before your elbows lock out, then slowly lower the weights back to the start position. Lie face up on an adjustable bench set to 30 to 45 degrees holding a pair of dumbbells over your chest with your arms extended and palms facing each other. With a slight bend in your elbows, lower weights out in an arc to your sides until you feel a good stretch in your chest. Contract your pecs to return the dumbbells to the start position, maintaining the slight bend in your elbows throughout. Cycle repeats with one day of rest on the weekend. *Dropset on the last set of the exercise, dropping the weight two to three times after reaching initial failure.